From left to right; Andrew McConkey, Chairman of LacPatrick Dairies; Michael Hanley, CEO of Lakeland Dairies and Alo Duffy, Chairman of Lakeland Dairies. Lakeland Dairies and LacPatrick Dairies have agreed to merge in a move which would see the new co-op become the second largest dairy processor on the island of Ireland. It was revealed on Wednesday night that the development has received the unanimous approval of the boards of both co-operative societies who are recommending the proposed merger to their respective shareholders at special general meetings on Tuesday, October 23. Exclusive discussions about a possible merger have been ongoing since last June and before the move is rubber stamped regulatory approval will be required. Lakeland Dairies and LacPatrick Dairies are neighbouring societies and both operate on a cross-border basis exporting the vast majority of their output to global markets. 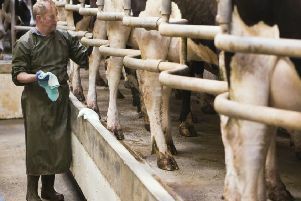 Mr McConkey said the board of LacPatrick firmly believes that an amalgamation with their neighbours is the best thing for milk suppliers, shareholders and customers. Meanwhile, Mr Duffy said the merger proposal is a once in a lifetime opportunity for both co-operatives to continue their strong progress in a very meaningful way. Mr Hanley added: “I am confident that the best interests of the shareholders and milk producers of both societies will be best served through this merger. “The economies of scale achievable by combining both societies will create a larger, more efficient, diversified, farmer-controlled, global dairy food group with a broad portfolio of value-added products and brands.